This post should go in more details about the LimeSDR crowdfunding campaign. As the inventors of the LimeSDR (Canonical/Ubuntu + Lime Microsystems) partnered up and now provide an open source framework to “create the next generation of wireless applications” and to democratize wireless innovation. This should be achieved by the development of a first class driver for LimeSDR by no other than Josh Blum, the original creator of GNU Radio Companion (and SoapySDR and Pothos) as well as with support by Myriad-RF, an initiative and community founded by Lime Micro that is dedicated towards as already said the democratization of wireless innovation (i can fully see the “Long Tail” here). The host driver is built on top of Lime Suite, a low level library that takes care of programming and calibration for the LMS7002M FPRF transceiver. Lime Suite also provides a GUI that lets you directly read and write to registers, update the Cypress FX3 USB 3.0 controller firmware and Altera Cyclone IV FPGA bitstream, and display FFT plots. They used SoapySDR, the vendor/platform neutral SDR support library, to provide a C++ API with C wrapper and Python bindings. 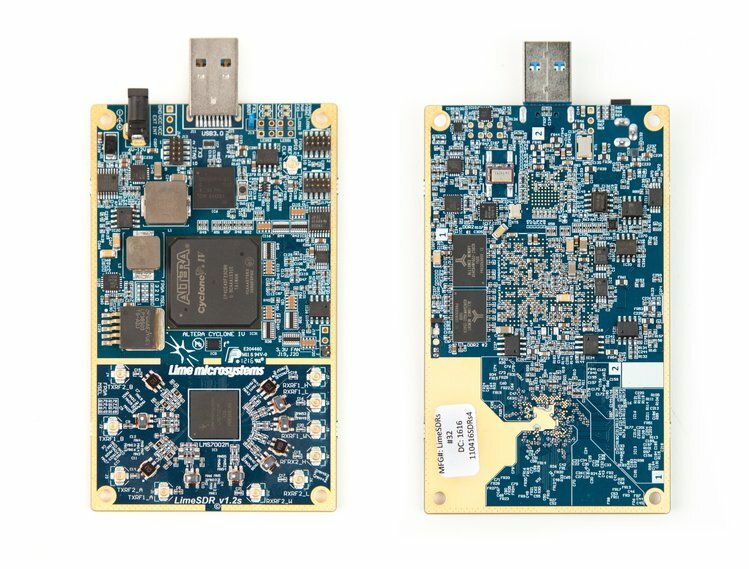 This architecture is modular and supports plugins, such as the UHD module, which lets LimeSDR use the UHDTM API, allowing access to a diverse array of existing SDR ecosystem software. The library also enables remote access support, which allows LimeSDR to be accessed transparently over the network by applications running on other hosts. Rapid application development is further enhanced with the combination of Pothos dataflow programming software suite and GNU Radio. With an extensive collection of DSP and related blocks, together with GUI environments that allow all manner of applications — from Bluetooth and WiFi to RADAR and radio astronomy — this combo lets you rapidly and easily build an application stack. The development environment is made even more accessible by the fact that the host driver, Lime Suite, and SoapySDR are all open source, as are Pothos and GNU Radio. The full Altium design database for LimeSDR, along with the USB controller firmware and FPGA RTL is also open source, meaning that if you need to implement some new firmware or FPGA feature, you can — in fact, you’re even free to make your own variant of the LimeSDR hardware and use elements of it in your own designs. In addition, a KiCAD recapture and layout is planned. A robust developer toolchain (thanks to the host driver implementation) lets you easily switch between applications and use the API support. With this support, you can be up and running with many existing applications in no time at all. In addition to providing the streaming interface, the driver also supports advanced features such as timed TX bursts and RX sample timestamps, as required for use with GSM and other time-sensitive protocols. They already made one use case: Wireless multi-tool IoT and released the source code for that. 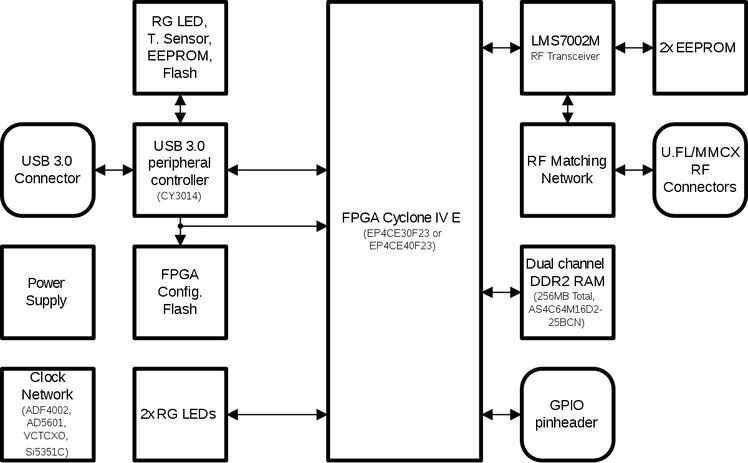 It demonstrates BLE decoding, RC switch control…. at least it shows what the platform is capable of. As of speaking of “apps”: There will be a nice ecosystem of Ubuntu’s newly introduced Snappy Core technology. Snappy Core gets rid of all the dependencies an application always brought with it (just think of building GNUR for 2 days in a row …) LimeSDR’s integration with Snappy Ubuntu Core means that you benefit from the collective work of developers around the world. With LimeSDR, we are laying the foundation for a world in which “there’s an app for that” applies not only to mobile phones, but also to the cell towers they connect to and, indeed, every wireless device or piece of infrastructure. LimeSDR brings with it many opportunities for educational and maker communities, empowering them to learn, and create new applications and even new markets. LimeSDR puts serious power in the hands of anyone who wants to innovate in the world of wireless. We no longer have to wait for established interests to innovate on our behalf. Board schematics:Altium project files available under CC BY 3.0 licence. Board layout:Altium project files available under CC BY 3.0 licence. Manufacturing:Gerbers, drill, and pick & place files are also available under CC BY 3.0 licence. FPGA:Altera Quartus project available under CC BY 3.0 licence. Host connectivity:Cypress FX3 USB 3.0 controller firmware sources available under Apache 2.0 licence. Host software:driver and GUI sources available under Apache 2.0 licence. Programming toolchain packages:GNU Radio, Pothos, SoapySDR, UHD. Downloadable apps:Snappy Ubuntu Core, licensing up to app developers. This entry was posted in General, LimeSDR, RX-Hardware, SDR. Bookmark the permalink.